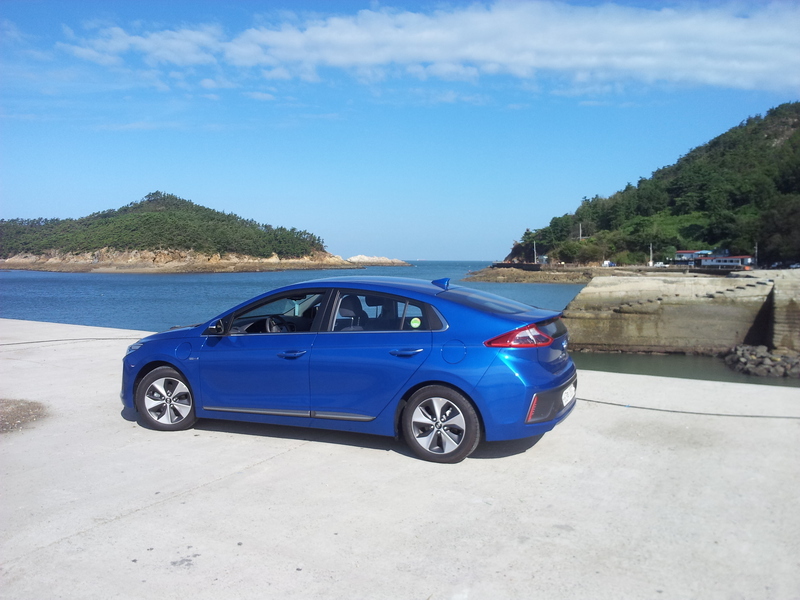 I recently got to spend a week test driving the Ioniq Electric around South Korea. Here's some photos. Apologies if there are missing images. It means tinypic is offline. Most interesting single drive was the East Coast. Set off on a 219km trip to the next charger with only 203km on the GOM. The car made it easily. 220km is the distance you can drive on the motorway at 110 km/h. Driving slower it is easy to go further than 280km. Last edited by JejuSoul on Sat Nov 05, 2016 5:33 am, edited 8 times in total. That is one incredibility positive test drive! Some more stats from the trip above. I started driving each day with 100% SOC. Lowest SOC on the trip was 24%. I had no range anxiety, the weather was great, traffic was light, and I had well planned the route beforehand. The car's navigation computer worked brilliantly. In Korea the fast charging socket is Chademo which is at the back so I reversed into all fast charging parking slots. It normally charges straight to 94%. But in my usage the charger stopped at 84% at four of the 8 different chargers I tested. The slow charging socket is J1772 which is at the front, so I faced forward at these chargers. The cable is locked onto the car when charging so that it cannot be unplugged. I unlocked it by pushing the unlock doors button on the key fob. The trickle charger ICCB worked well. I got about 10A from a 220V domestic socket. You cannot set the Charging Level. It just takes as much current as it can, up to a defined maximum. The English manual presumably has a typo for these current values. In Korea those values are 8A, 10A and 12A. I have read it is 6A, 9A, 12A elsewhere. There seems to be a typo in the English Manual. It is not 8A, 6A and 9A. I always charged immediately when plugging in. I never used delayed charging or climate. Unlike Kia's Soul EV there is no option to charge to 80%. Last edited by JejuSoul on Mon Oct 17, 2016 5:30 am, edited 8 times in total. Excellent second set of stats! This set of photos is from a Hyundai Service Center. I turned up just to get a free charge. There were a lot of Ioniq Hybrids in the Center having been recalled for a fuel injection problem, but I was the only Electric. They offered to service the car after charging. I got an upgrade to the Low Voltage DC converter. No cost, comfortable waiting area and very helpful staff. I was impressed. 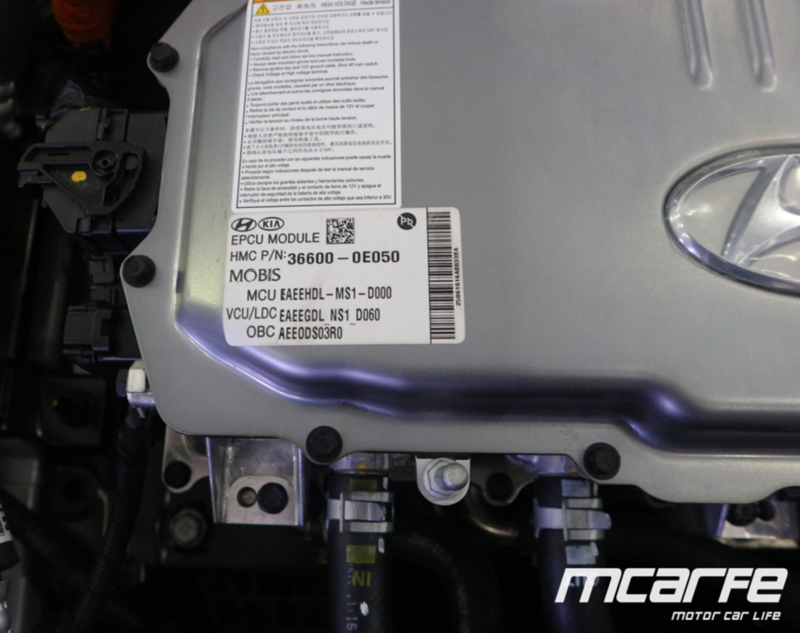 Note: The internal programming of the car is only possible by a Hyundai Service Technician. Updating the map however is DIY. (In Korea and US) The map is updated every quarter. The map updates also update the Navigation screen software. Here in Korea a popup message on the car tells you that new map software is available. I really wish we had the PID code to pull the ROM ID from each ECU. Last edited by JejuSoul on Wed Apr 25, 2018 5:07 am, edited 4 times in total. Looking at my data with from the recent trip I just took in an Ioniq EV. The Ioniq EV does particularly well when driving fast. Here are the Distance and Energy Economy stats. On the 21st September I drove on a fairly empty freeway for 343km fast. Weather conditions were perfect, 24C, dry, no wind. The speed limit was 110 km/h but I was often driving at 120 km/h or above. City traffic at the end meant my speeds for the last hour were significantly slower. I set off with 100% charge. I drove more than 200km at speed before needing to recharge. On the 22nd September I drove on a fairly empty freeway for 265km slowly. The speed limit was 80 km/h but I was often driving slower. This road was a 220 km stretch between chargers, hence in this specific circumstance having an Ioniq EV or other longer range EV is essential. Here's the best range I saw on the car, after a full charge. In reality you can do more than this, if you drive slowly. The Trip stats on my car give one value for each day. That value is not shown until the next day, hence I do not have the complete trip stats for my trip in this format. I tried to find a setting to change this back to the older format that lists each separate journey as a trip, but couldn't find it. The older software is shown in the manual. (Kia Soul EV still has the older version). It may be that cars outside of Korea come with this version. Last edited by JejuSoul on Thu Oct 13, 2016 3:00 am, edited 3 times in total. Here's some shots of the interior. 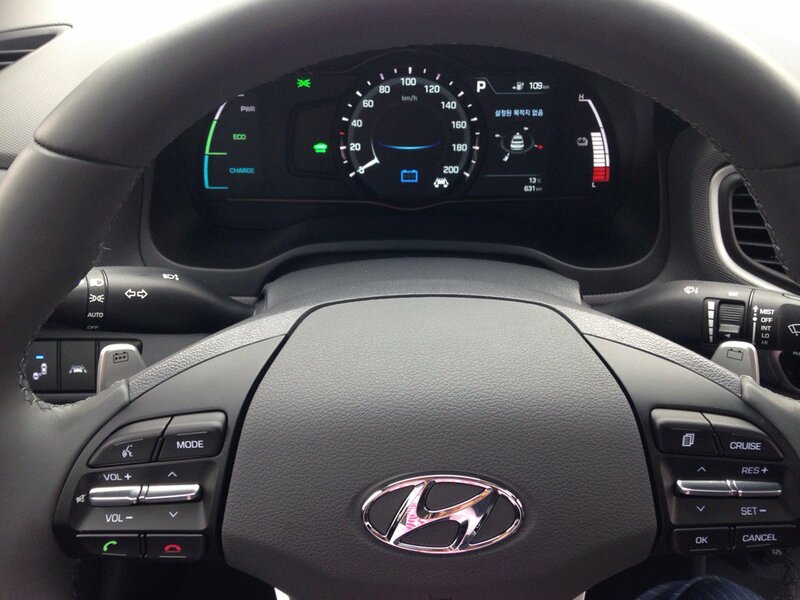 I really like the paddle shifters for changing the regen. The left paddle goes up 0 -> 1 -> 2 -> 3. The right paddle goes down. Level 0 (no regen = coasting) is fantastic for freeway driving. Level 3 (max regen) is fantastic for coming down a steep windy mountain road. I usually use level 2 in most other cases. The power button is badly placed. It is hidden behind the steering wheel. I never got used to this. Supposedly there is an inductive pad for charging mobile phones in the lower part of this picture. I don't have such a phone so never tested this. What I did use was the USB slot for music and the adjacent power slot as a charger.